Rising from the desert heat of Arizona is Whiskey Six with their first full-length album, American Grit. 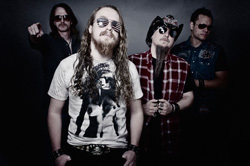 Whiskey Six takes some blues, a little country, some classic rock and metal and wraps it in a slight modern, d-tuned, wrapper for some rather infectious groove heavy rock. It's like Nickelback mashed with Texas Hippie Coalition, but often sounding better than both. All this is carried along by some very good songwriting and talented musicianship, not the least of which is Chris Strickler dusty vocals wetted by Jack Daniels and Dave Lansing's guitar. He can move between classic rock to southern slide with ease. While this style of country blues hard rock has been on the sidelines for many years, it certainly gets a large shot of much needed adrenaline from Whiskey Six. Easily recommended. 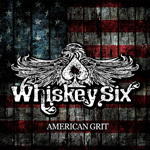 With American Grit, Whiskey Six delivers some entertaining hard rock groove, with a more than a little blues and country flair.